FINALLY real live score push notifications from the Serie A. On the minute live score notifications. Live standings table. Follow the changes to the standings table when games are being played. Serie A PRO always FREE from ADs. Screenshots are in Italian but the app is multilingual and also includes English. 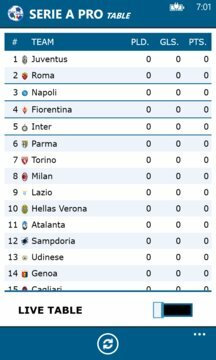 Serie A PRO is the app to follow standings, tournament schedule, live score, topscorer, and more in the Italian Serie A. Follow live matches and get notifications. Team page with overview of performance by each team throughout the season. See screenshot. It is possible to be notified from live matches. Settings let turn on and off notifications. You can get notifications even when the app is closed and your screen has been turned off.